Yesterday was my birthday, but tomorrow is the day Turner Classic Movies sends me the gift of a whole day of Cary Grant movies. I can't think of a better birthday present. The Cary Grantapalooza starts at 6 am Eastern/5 am Central time with one of Mr. Grant's best. 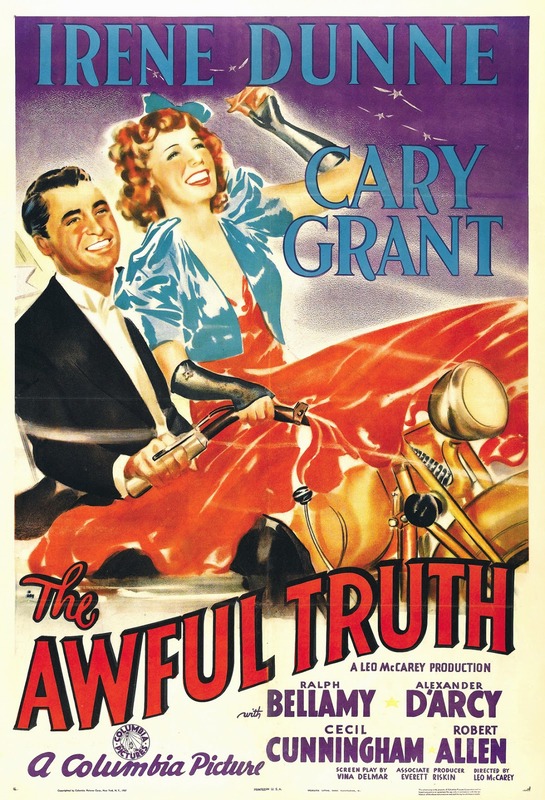 The Awful Truth, directed by Leo McCarey, is what has come to be called a screwball comedy. Specifically, it's a divorce comedy, with Grant and Irene Dunne as a husband and wife who split up and then flirt with getting back together. Dunne combines a certain daffy charm with intelligence and wit, making her an excellent match for the dashing Mr. Grant. Add Ralph Bellamy as the Wrong Man and Joyce Compton as the Wrong Woman, a performer named Dixie Belle Lee whose act includes fans blowing up her skirt, and the always adorable Asta, a very famous fox terrier, as Mr. Smith, their dog, and you end up with a winning romantic comedy that makes it clear why Cary Grant was already a hot item by 1937. After The Awful Truth, it's time for Howard Hawks' Bringing Up Baby, the 1938 Katharine Hepburn/Grant comedy which plays both actors against type. Hepburn is a loopy heiress with a missing leopard named Baby and a mischievous dog (once again played by Asta), while Grant is a bespectacled professor of paleontology whose entire life is turned upside-down by Hurricane Hepburn. It's a famous example of another niche in the romantic comedy genre, the one where a woman with wild ways hooks up with (and loosens up) a buttoned-up man. See: Ball of Fire, The Lady Eve, Something Wild... 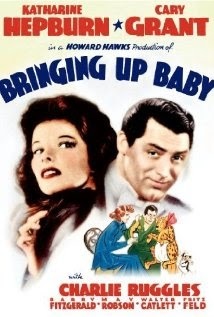 Bringing Up Baby was famously not a hit at the time, just about when Katharine Hepburn hit the Box Office Poison list. But it's been rediscovered by generations of film students and rom com fans, making it a perennial favorite. Bringing Up Baby starts at 6:45 am Central time. Howard Hawks also directed His Girl Friday, the super-fast-talking 1940 comedy based on The Front Page, which airs at 8:30 am. Rosalyn Russell plays Hildy, the reporter (and ex-wife) trying to work around her controlling editor, played by Grant, while he does everything he can to keep her on his payroll and in his life. My Favorite Wife, which pops up at 10:15 am Central time, will look familiar to fans of Move Over Darling, a Rock Hudson/Doris Day trifle from 1963. You'll recognize the old Enoch Arden plot, where a presumed dead spouse (Dunne) returns at the precise moment the left-at-home spouse (Grant) is moving on with someone else. And, yes, it's a comedy. It pairs Grant with Irene Dunne again, this time with Garson Kanin in the director's chair and Randolph Scott as the Wrong Man. It's also much, much better than Move Over Darling. 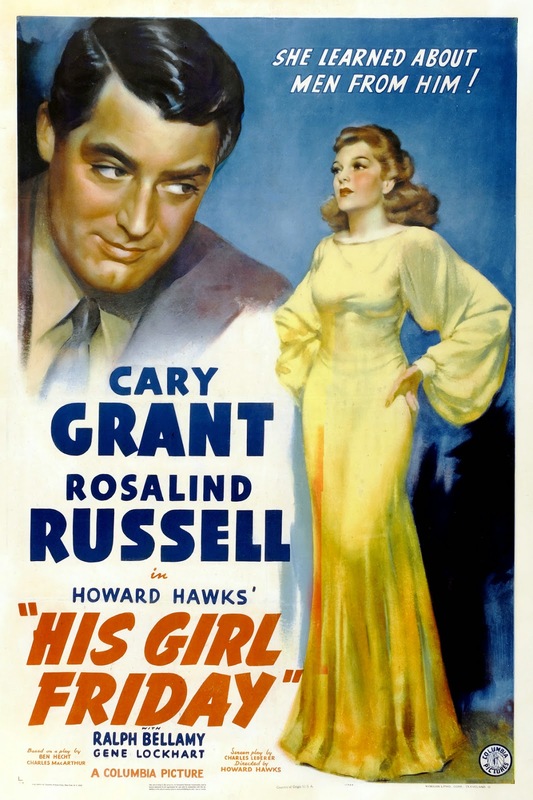 His Girl Friday, My Favorite Wife and The Philadelphia Story, playing on TCM at 11:45 am Central time, were all released in 1940, a banner year for Cary Grant. Jimmy Stewart won the Best Actor Oscar for his performance as a "man of the people" writer who vies against dapper ex-husband C. K. Dexter Haven, played by Grant, for the affections of Hepburn's Tracy Lord. Hepburn was nominated for Best Actress, as was Ruth Hussey, who played the fourth member of the quartet. Why no nomination for Grant? I have no idea. He and Hepburn are perfect for each other and perfectly directed by George Cukor. Arsenic and Old Lace brings Grant up to 1943, putting him into a classic comedy about two older ladies cheerfully dispatching lonely men into the Great Beyond by way of poisoned elderberry wine. He's the normal nephew, trying to juggle corpses, gangsters and cops while hoping to keep his aunties out of trouble. Arsenic airs at 1:45 pm Central time, followed by The Bachelor and the Bobby-Soxer, with Myrna Loy and Shirley Temple, at 3:45 pm Central time. Every Girl Should Be Married, a bit of a mess of a film from 1948, is notable only because Grant plays opposite Betsy Drake, one of his real-life wives. It plays at 5:30 pm Central, a good time to take a snack break and wait for Hot Saturday, in the marquee spot at 8 pm Eastern/7 pm Central. This little-known 1932 potboiler is all about small-town girl Ruth Brock, a good girl bank clerk, whose reputation is unfairly sullied. If you want to see what Cary Grant looked and acted like before he was CARY GRANT, check out Hot Saturday. You'll see a very different, older, more settled Cary in Mr. Blandings Builds His Dream House, a movie that's more about how tough it is for a city-dweller to move to the country. Note that his character's name is Blandings. If you'd like to see mature Cary put-upon by house-building nightmares, check out Mr. Blandings Builds His Dream House at 8:30 pm Central time. Gunga Din shows yet another side of Mr. Grant. Adventure Cary goes to India with pals Victor McLaglen and Douglas Fairbanks Jr. to stop the Thuggees. And Sam Jaffe, a Jewish guy from New York City, plays Indian water carrier Gunga Din. 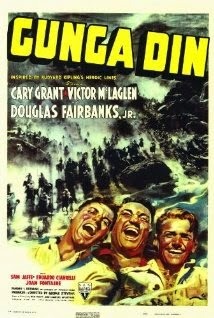 You can judge Gunga Din's questionable politics for yourself at 10:15 pm Central time. Destination Tokyo, the after-midnight movie, is a more standard war story from 1943, with Grant captaining a submarine that ventures into dangerous waters. That leads him into 1952 and Room for One More, a family film about parents "Poppy" and Anna Rose, who build their family by adopting orphans. It's sweet and a little sappy, not one of the movies people usually think of when they think of Cary Grant, but still... It has its charms, and it's another opportunity to see the wonderful Cary with Betsy Drake, wife no. 3. I'm afraid that's the end of Cary Grant Day. TCM is on to Charlie Chaplin Day at 5 am on Thursday. But if you're like me, you'll pull out DVDs of Holiday, Notorious, North By Northwest, Charade, To Catch a Thief and maybe even Mr. Lucky to keep the party going.